The online version of this article ( https://doi.org/10.1186/s40317-019-0169-3) contains supplementary material, which is available to authorized users. Studying animal behavior while minimizing levels of invasiveness is a challenge many biologists face [1, 2, 3]. Difficulty also arises while attempting to observe animals in environments and during time periods that are relatively inaccessible to humans . The scientific field of biologging arose, in part, to address these two main obstacles . Since the first use of tagging devices on animals in 1963, the field of biologging has evolved into a discipline that allows for the detailed behavioral study of animals ranging from chipmunks to blue whales [5, 6, 7]. Over the years, a variety of unique tagging devices (i.e., DTAGs , Acousonde tags , etc.) have been developed by researchers around the world to try to gain access into the lives of animals. Using data obtained by these tags, scientists can determine the exact time when an animal exhibited a certain behavior [10, 11, 12, 13, 14, 15, 16, 17]. 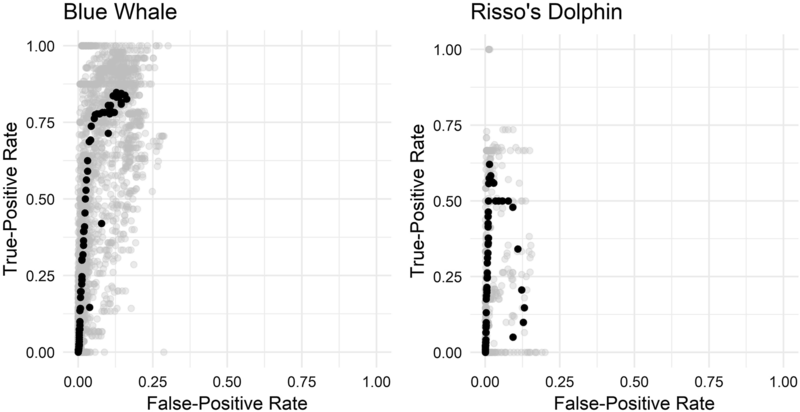 For example, a recent study identified potential sleeping behavior in harbor porpoises (Phocoena phocoena) by searching for inactive, uniform diving behavior using acceleration, depth, and acoustic data obtained from data-logger tags . Another study used accelerometer tags attached to the heads of two Antarctic penguin species to detect peaks in the acceleration signal and thus study prey encounter rates of these species . 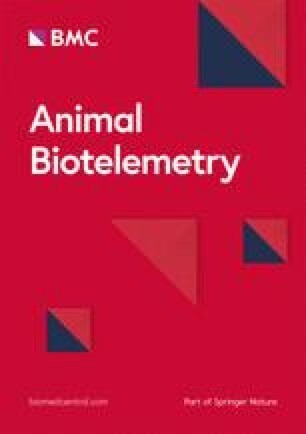 Additionally, recent work with Weddell seals (Leptonychotes weddellii) and Antarctic fur seals (Arctocephalus gazella) used accelerometer tags attached to the mandible to detect signatures in the accelerometer signal indicative of mouth opening associated with feeding events [18, 19]. Due to the often-high sampling rate of multisensor tags and the long duration of data recording, the process of determining the time of every instance of a given behavior can be quite arduous . Scientists have begun to develop automated animal behavior detection algorithms to improve the efficiency of multisensor data analysis. They scan through data searching for signal characteristics that are known to be indicators of unique animal behaviors. Many of these detection algorithms are designed to detect feeding attempts by animals in animal-borne tag data [15, 20, 21, 22, 23, 24, 25]. For example, Cox and colleagues developed a method to detect foraging behavior in juvenile southern elephant seals, but their code is highly specific to Argos relay satellite tags and requires triaxial acceleration and pressure data . The detection of feeding attempts is commonly desired, because knowing when a predator hunts (and captures) prey can allow for more in-depth analyses of various ecological parameters, including, for example, studying the overall energy expenditure of foraging species . While many of these event detection methods have very specific data format requirements, more adaptive methods that can easily be applied to data from different species and tag types would facilitate inter-study and inter-specific comparisons and meta-analysis of a variety of different animal behaviors. For a behavior to be detected and analyzed using automated detection methods, a proxy must exist from which the behavior can be identified. Blue whales feed by lunging toward a prey patch while simultaneously opening their mouths, thus generating peaks in the norm-jerk signal due to produced and incurred changes in acceleration [27, 28, 29]. Risso’s dolphins emit buzz sounds during close pursuit, attempted capture, or capture of prey. Recently published studies have shown that peaks in the norm-jerk signal are often associated with the end of the buzz when the sound is associated with a prey capture attempt [10, 30, 31]. A useful proxy commonly associated with foraging events in cetaceans is therefore the norm-jerk signal. 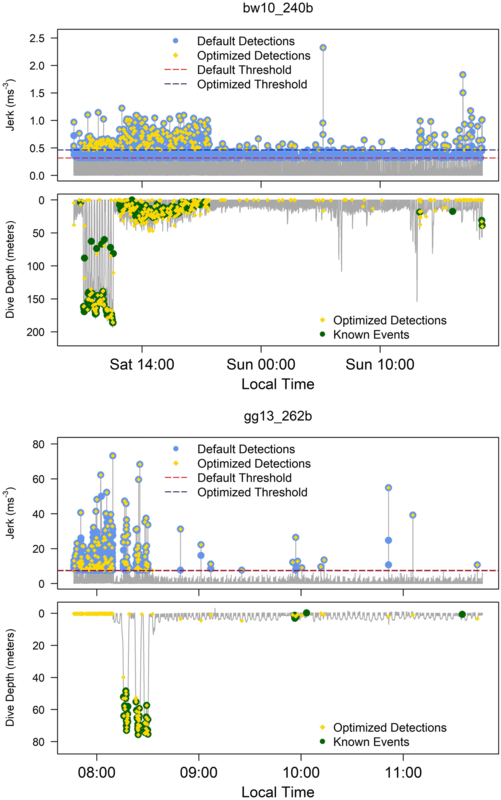 The performance characteristics of detect_peaks alone show evidence for the usefulness of this automated behavioral event detection algorithm, given that they perform at similarly high levels compared to previously developed methods. However, unlike the other previously mentioned detection methods [20, 23, 24, 25], detect_peaks was intentionally designed to be capable of detecting a potentially endless list of behaviors from many different species. The simple algorithm used by detect_peaks has potential for use in real-time or on-board processing in telemetry tags, if validated for a particular species and tag type. In addition, given that many scientists have limited time or software development capabilities, we believe that making this detection method freely available as part of open-source software for high-resolution movement-sensing tags has the potential to make event detection in biologging data easier and more reproducible. Additional file 1. Data spreadsheets displaying the detection statistics and tag deployment information for all animal individuals used in this study. Additional file 2. File containing ROC curve and side-by-side plot figures similar to those displayed above in the manuscript for all Risso's dolphin individuals used in this study. Additional file 3. File containing ROC curve figures and side-by-side plot figures similar to those displayed in the manuscript for all blue whale individuals used in this study.